AAA projects 2.4 million New Englanders will travel 50 miles or more away from home this Thanksgiving, a 5% percent increase over last year. 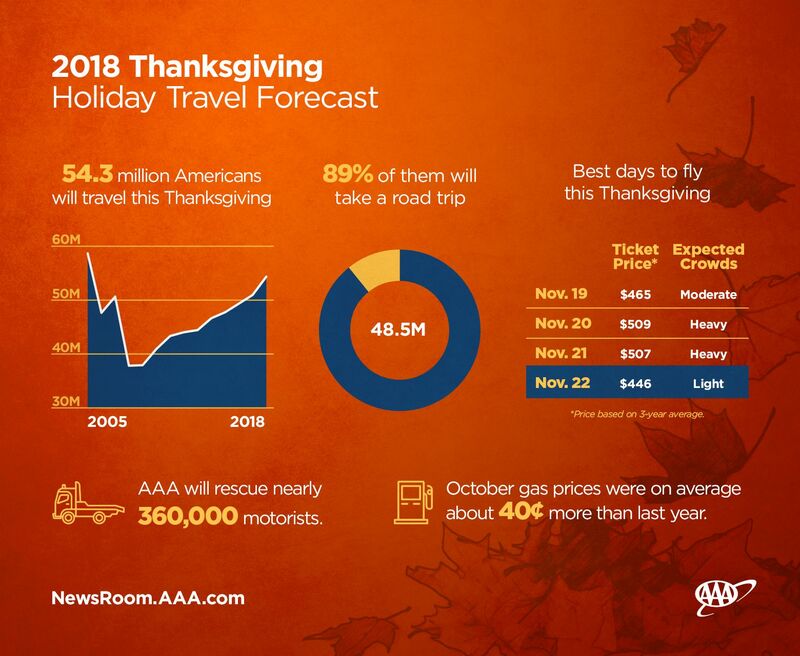 The 2018 holiday weekend will see the highest Thanksgiving travel volume in more than a dozen years (since 2005), with 115,000 more people taking to roads, skies, rails and waterways compared with last year. INRIX, a global mobility analytics company, predicts travel times in the most congested cities in the U.S. could be as much as four times longer than a normal trip. Planes: Holiday air travel is expected to increase 6.1 percent to 276,00 leisure travelers. Trains, Buses, Rails and Cruise Ships: Travel across these sectors will see a slight decrease by .6 percent to 43,000 passengers. Based on historical and recent travel trends, INRIX, a global mobility analytics company, in collaboration with AAA, predicts drivers will experience the greatest amount of congestion Thanksgiving week during the early evening commute period, with travel times starting to increase on Monday. The best days to travel will be on Thanksgiving Day, Friday or Saturday. Drivers should expect increased travel times on Sunday, as most holiday travelers will be making their way home after the long weekend. Motorists can expect to pay the highest Thanksgiving gas prices in four years, with a national average of $2.65 as of November 15, 9 -cents more than a year ago. Vermont’s average current price is $2.82 per gallon, which is 3 cent lower than one week ago, and 22 cents higher than one year ago. New Hampshire’s average current price is $2.66 per gallon, which is 5 cents lower than one week ago and 14 cents higher than one year ago. Maine’s average current price is $2.63 per gallon, which is 7 cents lower than one week ago, and 6 cents higher than one year ago. “Motorists have become accustomed to this year’s more expensive gas prices and won’t let higher fuel costs deter them from taking Thanksgiving road trips,” said Moody.